The following information is provided as part of an effort to keep the community informed about the development of the UGA Health Sciences Campus, a significant addition to the University of Georgia. The Health Sciences Campus has been established on the site of the former Navy Supply Corps School on Prince Avenue in Athens. The property was deeded to the university by the U.S. Department of Education in April 2011. Classes at the Health Sciences Campus will begin in August, and the community is cordially invited to an open house celebration on Aug. 22. At this time, all facilities renovated as part of Phase I will be open and available for view. The Health Sciences Campus accommodates two primary occupants: the UGA College of Public Health and the Georgia Health Sciences University/UGA Medical Partnership. • and the former conference area of Wright Hall, to house the College of Public Health’s Center for Global Health. Miller Hall has been occupied since January and Wright Hall since March. Academic units have spent the month of July moving into Winnie Davis, Russell and George halls. These academic facilities are complemented by the opening of Pound Hall/Wheeler Hall as an exercise facility/recreational gym for faculty, staff and students. Also, the townhouses and homes on the former Navy base are being leased to graduate and medical students as well as visiting scholars. In addition, enrollment at the University Childcare Center is expected to reach its full capacity of 146 children (ages infant through four years of age) by the end of the calendar year. The University Childcare Center is located in the former Navy Exchange building and is operated by a third-party provider, Prodigies Child Care Management. By fall 2012, it is estimated that approximately 550 public health and 120 medical partnership students will be taking classes at the campus. Coupled with academic faculty/staff estimates-another 140 people-the projection is for more than 800 faculty, staff and students to be based there. Renovation for Phase II commenced in early July. Facilities in that phase, as approved by the University System Board of Regents, include Rhodes Hall, to accommodate the administrative headquarters (dean’s office) of the College of Public Health; and Scott Hall, the former officers’ club facility, to serve as a student center/dining hall for the campus. Both facilities will be ready for occupancy in fall 2013. University Housing also plans to renovate Brown Hall (a former dormitory/hotel) to serve as a residence hall. http://news.uga.edu/releases/article/uga-health-sciences-campus-update-for-january-2012/, http://news.uga.edu/releases/article/health-sciences-campus-update_10-19-2011/, http://news.uga.edu/releases/article/health-sciences-campus-update/ and http://news.uga.edu/releases/article/uga-and-u.s.-department-of-education-deed-conveyance-ceremony/. 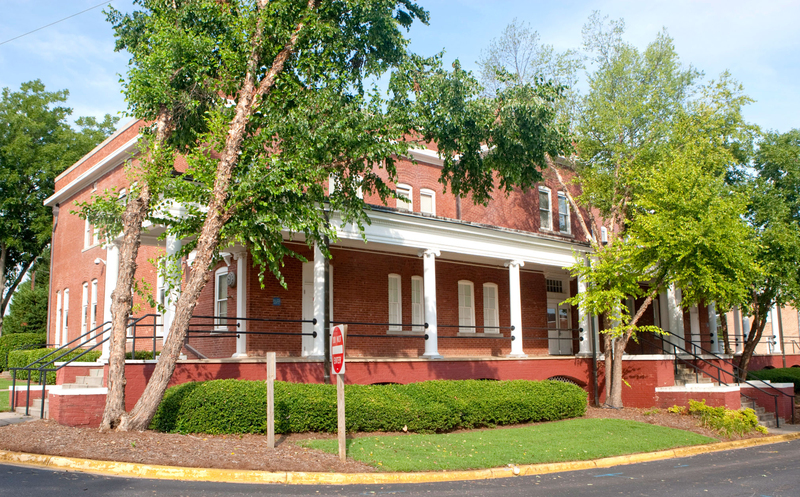 For additional information on the UGA Health Sciences Campus, contact Kathy Pharr at 706/542-1361 or pharr@uga.edu.